This was a new one to me…Big Cartel…an online shopping site “bringing art to the cart”!!! Kim Westad uses Etsy, Supermarket and Big Cartel for 75% of her sales. 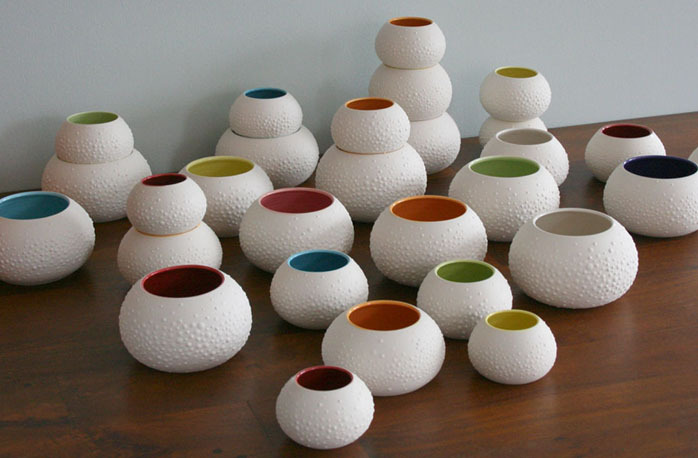 She uses bright color framed in white or vice versa in her porcelain pieces…some with random scatterings of white dimensional accents. Happy Birthday to my sister, Eileen. Eileen is one of the fiber artists in the family. You can follow her nomadic and artistic escapades on her blog, 2muchfun.